The two leaders have fallen "in love" through letters, Trump once said. 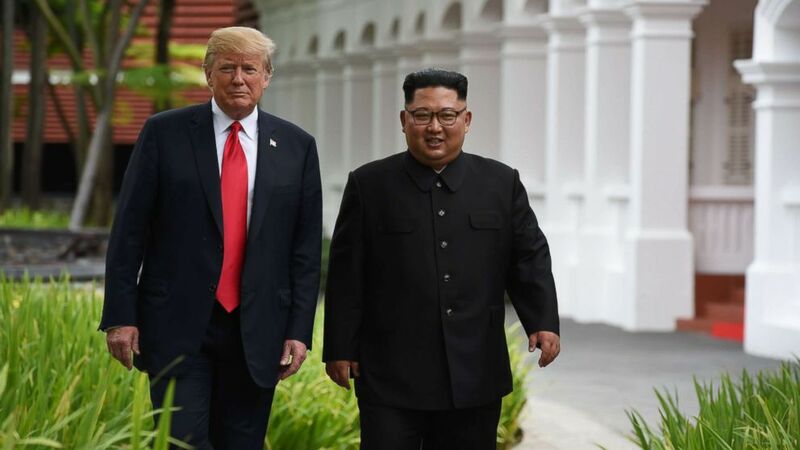 Kim Jong Un has received another letter from President Donald Trump, one that prompted the young leader to express "great satisfaction," according to North Korean state media and confirmed by a senior administration official. The two leaders have exchanged a series of letters before and after their historic meeting in Singapore last June. Now, the U.S. and North Korea are preparing for a second summit -- with Kim and Trump once again communicating directly through letters. (Pool via AFP/Getty Images) President Donald Trump walks with North Korea's leader Kim Jong Un during a break in talks at their summit, at the Capella Hotel on Sentosa island in Singapore on June 12, 2018. These letters have built a strong rapport between the two men, with Trump at one point saying they led to them falling "in love." "I was really being tough, and so was he, and we would go back and forth -- and then we fell in love, OK? No, really," he told supporters at a political rally in West Virginia on Sept. 29. "He wrote me beautiful letters, and they're great letters. We fell in love." (Saul Loeb/AFP/Getty Images) Secretary of State Mike Pompeo welcomes North Korean Vice-Chairman Kim Yong Chol to a meeting in Washington, Jan. 18, 2019. Trump's most recent letter to Kim was hand-delivered by North Korea's top nuclear negotiator and former spy chief Kim Yong Chol, who met with Trump and Secretary of State Mike Pompeo in the Oval Office last Friday. It was the first high-level meeting since he abruptly canceled a meeting with Pompeo in early November, leaving talks quiet and at a stalemate. 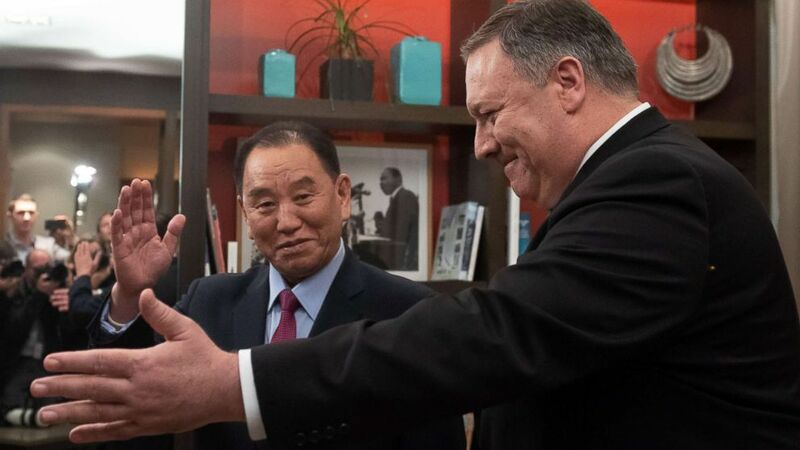 While Pompeo and his counterpart spent 40 minutes or less together, Kim Yong Chol spent over 90 minutes at the White House with the president. It's part of a strategy, analysts said, to work directly with Trump, who speaks warmly of Kim. North Korea has "never written letters like that," Trump said in early January of another missive. "This is a great letter ... We really established a very good relationship. A lot of good things are happening." 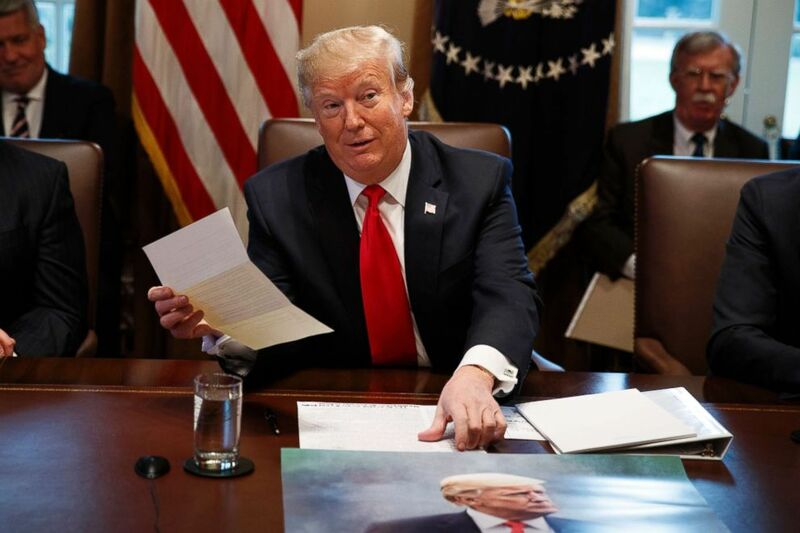 (Evan Vucci/AP, FILE) President Donald Trump holds up a letter he says is from North Korean leader Kim Jong Un during a cabinet meeting at the White House, Jan. 2, 2019, in Washington. North Korea seemed as pleased with Trump's most recent response. Korean Central News Agency, the country's state media, called it a "good personal letter" from Trump, saying Kim "expressed great satisfaction" after reading it. "He spoke highly of President Trump for expressing his unusual determination and will for the settlement of the issue with a great interest in the second DPRK-U.S. summit," it added. Kim also ordered staff to begin making "technical preparations" for that second summit, according to KCNA. The two leaders are scheduled to meet "near" the end of February, according to the White House -- with one U.S. official telling ABC News that Vietnam is the most likely choice.